John Jacobs Jr., the only chaplain in his U.S. Army battalion, stood on a blood-soaked plywood board as he conducted a worship service for soldiers at a tiny combat outpost in the mountains of Afghanistan. Many wounded soldiers had been brought to this spot for transport back to a base hospital. This lonely outpost was one of numerous stops for Jacobs as he traveled 5,000 miles – mostly by helicopter – to visit the 750 members of his battalion during his 10-month tour of duty in 2009. Jacobs, who graduated from Eastern Mennonite Seminary in 2004 with a master of divinity degree, planned to return to EMS this fall to enroll in Clinical Pastoral Education. The intensive hospital-based program would prepare him for chaplaincy work among veterans and in hospitals and hospices. But he recently received notice that he is being called up in early 2014 for a 9-to 12-month deployment to the Middle East, to be stationed in Qatar. Jacobs is part of the Virginia National Guard, so he must be ready for duty at any time – at home or abroad. Stateside duty includes accompanying a senior officer to notify parents that their son or daughter has been killed. In a war zone, a chaplain’s duty is to nurture the living, comfort the wounded, and honor the dead. In addition to leading Christian services and performing various sacraments, Jacobs prayed with wounded soldiers from the battlefield and accompanied them to the operating room. “In general, we are supposed to bring the presence of God,” he said. Jacobs also did a lot of marriage counseling for the many soldiers who were separated from their spouses. Since Jacobs is a Protestant chaplain, he was also responsible for making sure that members of his battalion who were not Protestant had access to Catholic or other appropriate members of the clergy. The seed for military chaplaincy was planted in Jacobs’ mind after he completed nearly 13 years of active duty in the U.S. Army. First he had to finish an undergraduate degree and then find a seminary to attend. He picked EMS, arriving with his wife and three children in 2001. While in seminary he took part-time jobs, making sure that he was able to interact with “common people,” which he figured would help him in future ministry. In fact, ministry started for him on the job. “I talked about faith with people who would never come to church,” he said. Jacobs and his wife, Diana Patterson, are both from Lancaster County, Pa. John was raised Presbyterian and Diana was Mennonite. They were married when he enlisted in the Army at age 21. His first Army career took them to Alaska, South Korea, Pennsylvania, and Colorado. Since his seminary days, the Jacobs family has been based in nearby Broadway, Va. He hopes that a future job in hospital chaplaincy will bring more stability to his life and more focus to his career. Thank you for this touching story of sacrifice and hope. For the soldiers serving this country and the people of Afghanistan, Chaplain Jacobs brings comfort and the real presence and love of God. Even in a war zone, the Creator God does not take sides; all are loved equally and completely. God bless, Chaplain Jacobs. Thank you so much John Jacobs Jr. 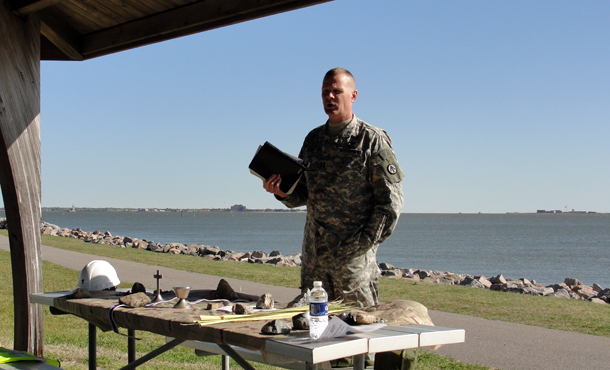 The Chaplain is an integral part of any military unit in all branches of the service. The war zone theatre of operations is especially important as are forward operating medical and surgical hospitals and aid stations. The Chaplain is in a unique position, as there may be multiple medical specialists, (though not in all area’s). The Chaplain however is the only one there to minister to the soul and to the men and women who are in dire need of that ministry, regardless of how religious they were or were not stateside. God be with all soldiers, marines,airmen, sailors, and coast guardsmen (these days, men and women) and with their families and friends who pray for them daily, as do many americans’ now as part of daily worship.